It is not a given that we must lose teeth as we age. If we maintain good oral hygiene and have regular professional cleanings and oral examinations, chances are we can keep our natural teeth for life. That involves not only caring for the teeth themselves, but also the structures that surround them: the gums and tooth-supporting bone. Gum disease, which is a bacterial infection, threatens these supporting tissues. That is why dental professionals are always on the lookout for early signs that patients may not notice. When signs of trouble become apparent, periodontal therapy may be suggested. Periodontal therapy can take various forms, but the goal is always to restore diseased tissues to health. Gum (periodontal) disease can spread from the gums to the bone that supports the teeth, and may even cause tooth loss in the most severe cases. There are very effective therapies to combat this, ranging from scalings (deep cleanings) that remove plaque and calculus (tartar) from beneath the gum line, to surgical repair of lost gum and bone tissue. Scaling and Root Planing. These deep-cleaning techniques are the best starting point to control gum disease. Plaque and calculus (tartar) are removed from beneath the gum tissues, using hand scalers and/or ultrasonic instruments. Gum Grafting. Sometimes it's necessary to replace areas of lost gum tissue so that tooth roots are adequately protected. This can be accomplished by taking healthy gum tissue from one area of the mouth and moving it to where it is needed, or by using laboratory-processed donor tissue. Periodontal Plastic Surgery. When used to describe surgery, the word “plastic” refers to any reshaping procedure that creates a more pleasing appearance of the gum tissues. 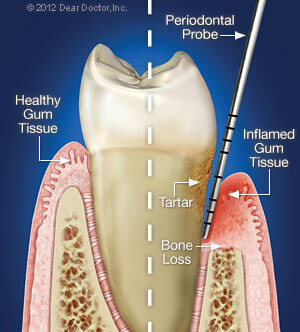 Periodontal Laser Treatment. Removing diseased gum tissue with lasers can offer significant advantages over conventional surgery, such as less discomfort and gum shrinkage. Crown Lengthening Surgery. This is a surgical procedure in which tooth structure that is covered by gum and bone tissue may need to be exposed either for cosmetic reasons (too make the teeth look longer and the smile less gummy) or to aid in securing a new dental crown. Dental plaque is the main cause of periodontal disease, so it's essential to remove it every day with effective brushing and flossing. This doesn't mean scrubbing, which can actually cause your gums to recede. Proper techniques can be demonstrated for you, if you have any questions. Of course, there are some areas of the mouth that a toothbrush and floss just can't reach, which is why it's so important to have regular professional cleanings at the dental office. Your regular dental exam is also a time when early signs of gum disease can be detected — before they become apparent even to you. Eating a nutritious diet low in sugar, and staying away from tobacco in all forms, will also increase your periodontal health — and your chances of keeping your teeth for life.